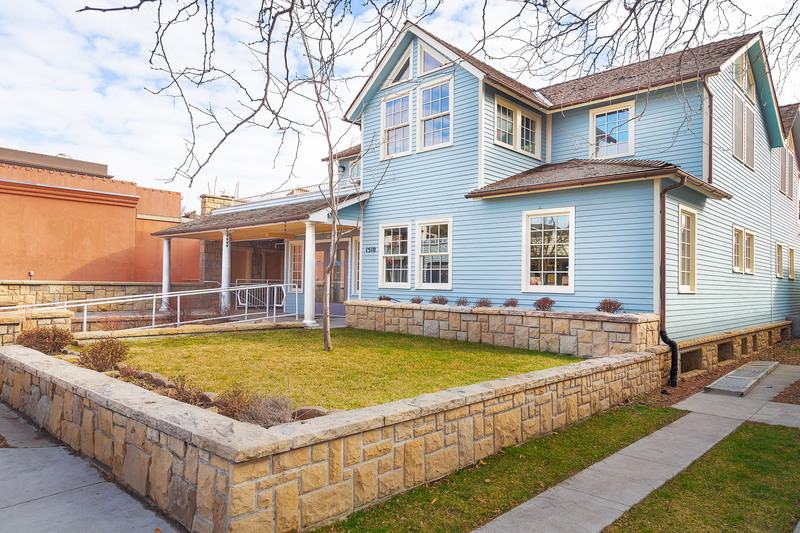 1510 N 13th St. is a historical property in Boise's Hyde Park district. 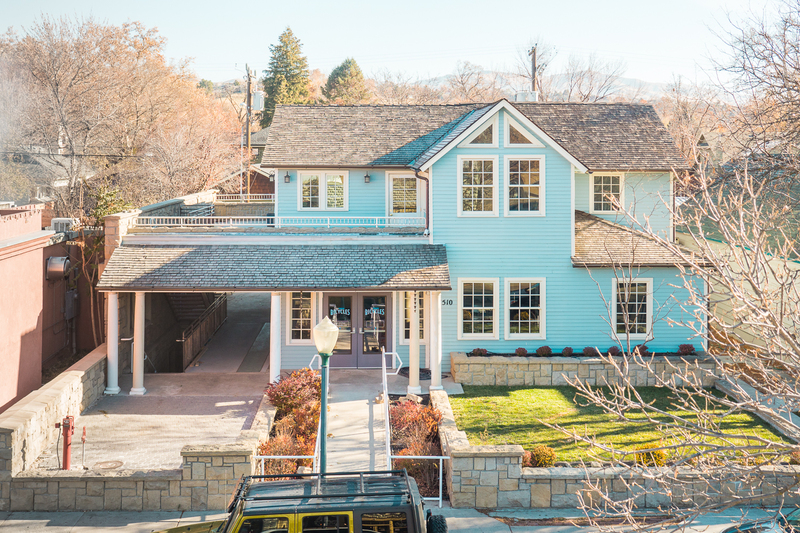 In 2005 the property owner began an extensive remodel on the original building, but due to the recession and other reasons was never able to finish the project. 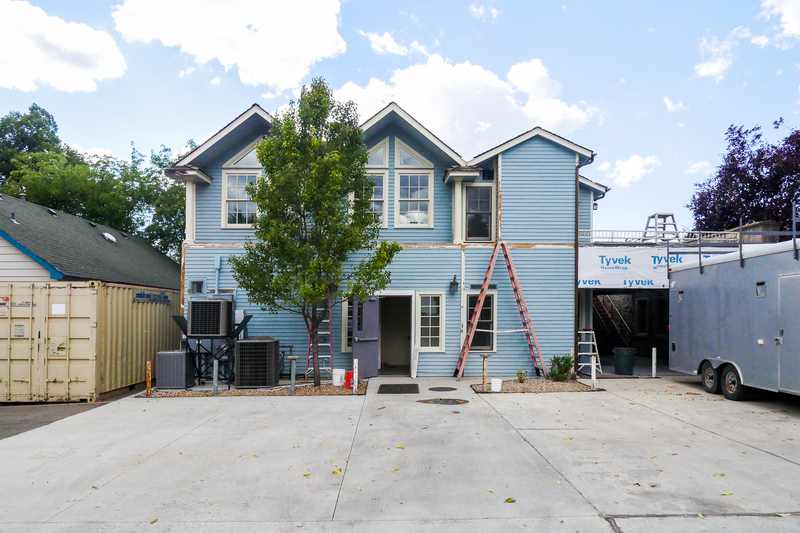 We worked closely with the owner and City of Boise to help finish the project. 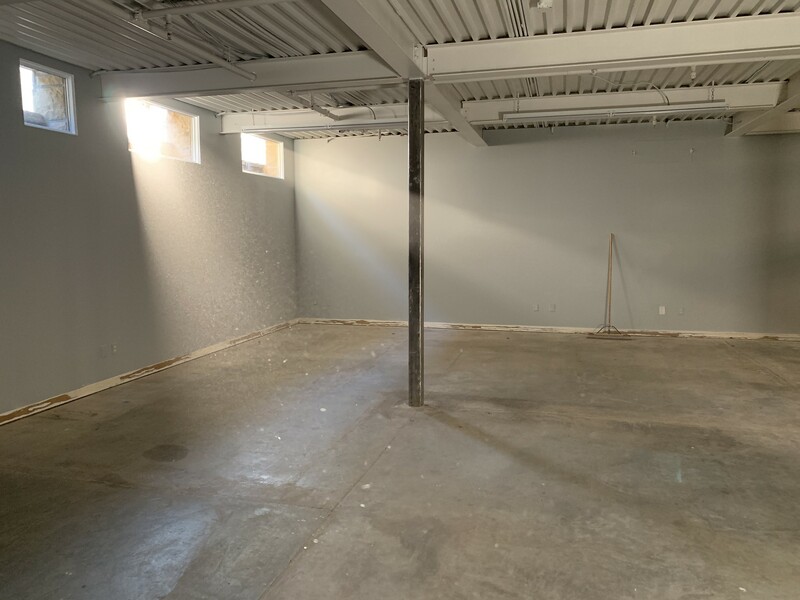 When we started on the building in the fall of 2018 the building had either been under construction or abandoned for a total of 13 years. 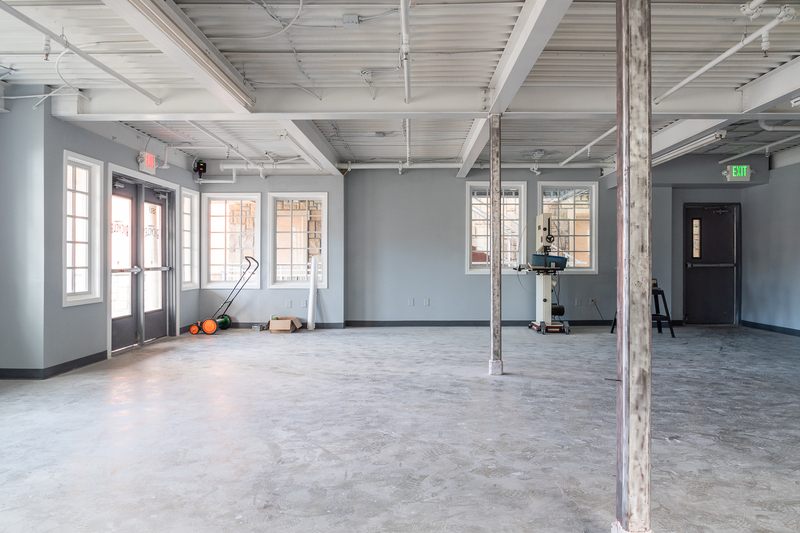 The main floor has 3 separate entrances, and eventually we'll finish the apartment (beige-colored door) above the shop and turn it into a sporting-themed getaway for visiting athletes. The building has over 2000 ft of patio space. A extensive breezeway covers much of the patio. 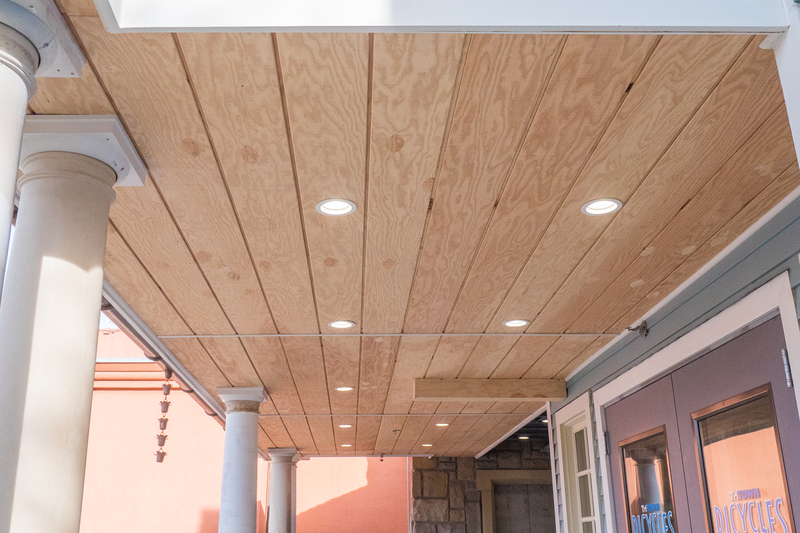 We installed a beautiful cedar ceiling for the front of the breezeway, and we'll eventually continue this cedar ceiling along the entire breezeway. 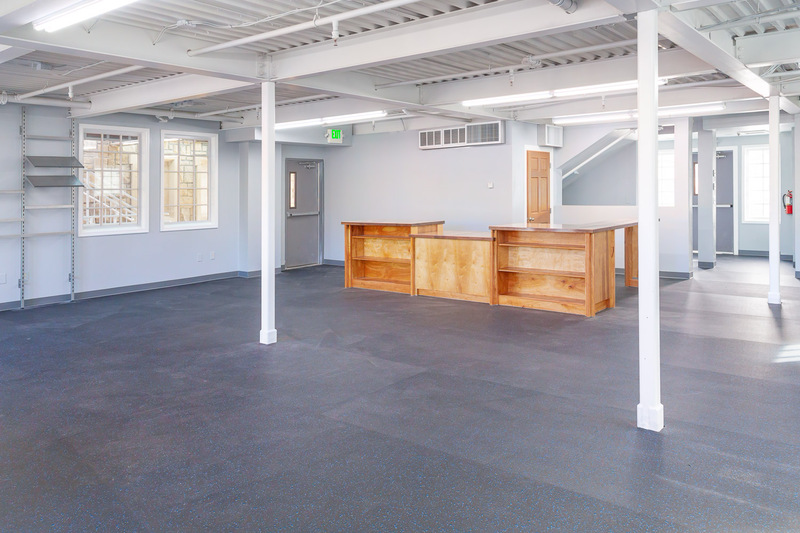 We chose a high density rubber for flooring. Not only is this material easy to clean, but it's a great surface to work on, or walk on if you're wearing cycling shoes. It also saved over 300 car tires from the landfill. 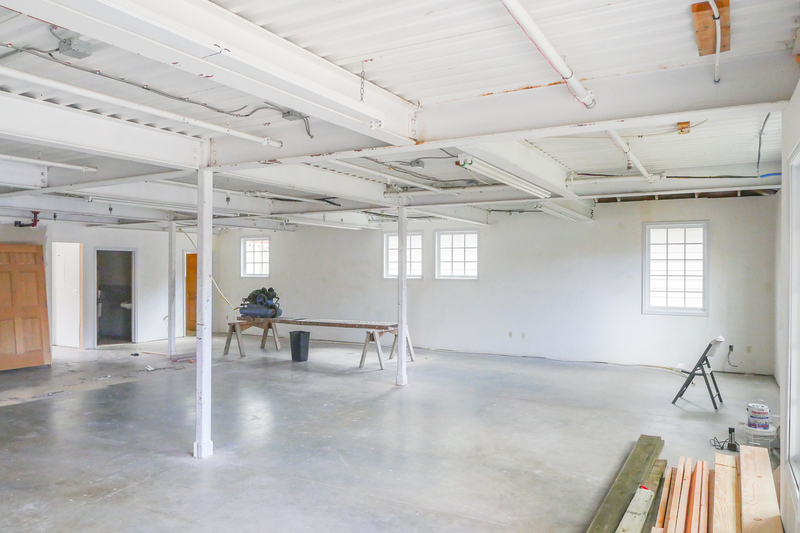 The basement level has 12 foot ceilings and 9 windows to bring in natural light. All the windows in the basement are a custom size, and some of the windows had been broken over the years. Having them fixed/replaced was one of the first steps of the project. 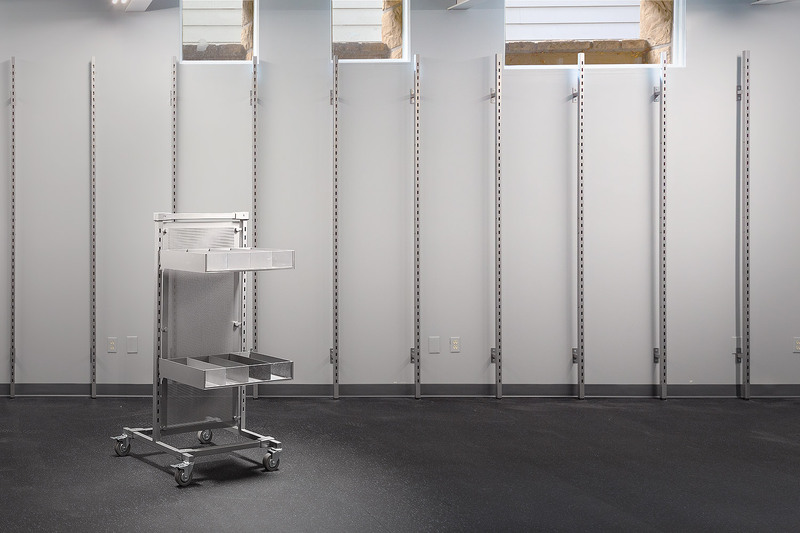 Here we have finished the basement flooring and installed a racking system to eventually hold inventory. 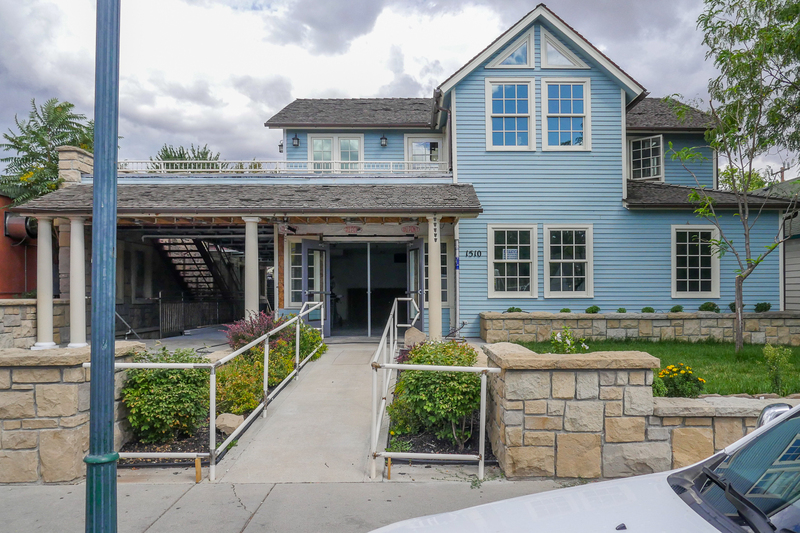 The North wall and many of the patio walls are made of sandstone from Boise's Table Rock quarry. Our shop owner moonlights as a woodworker. 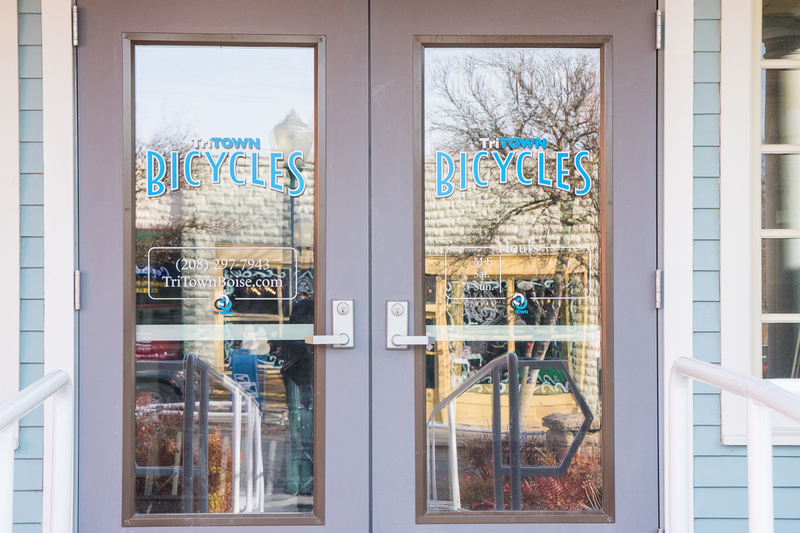 Almost all the shop's furniture, counters, benches, bike racks, and more were hand built by the Tri Town staff. 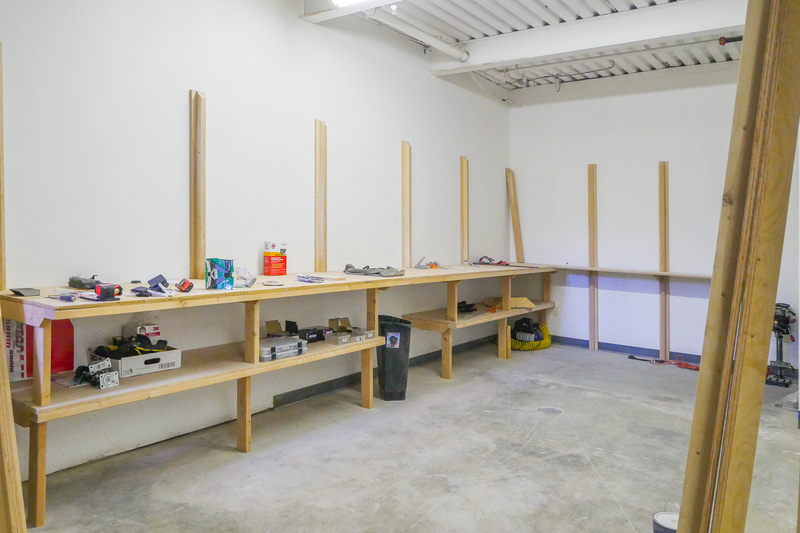 Here we're looking at the sliding 'French cleat' bike rack system used throughout the shop. 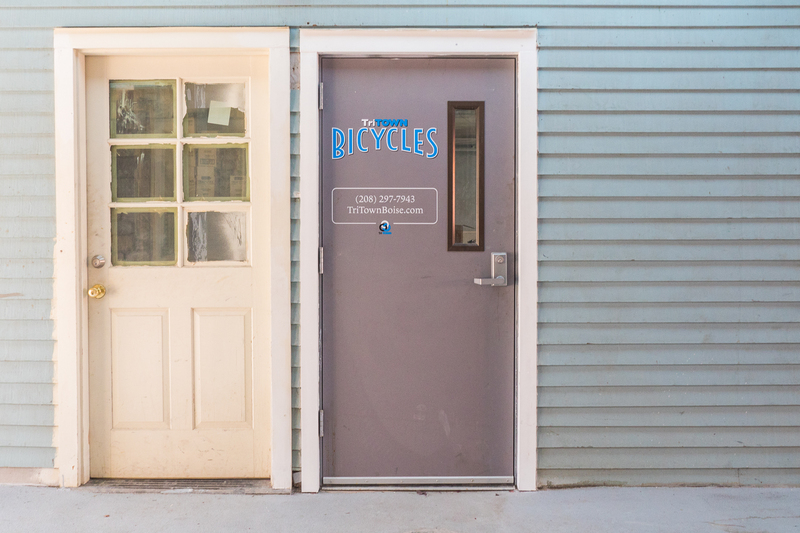 The bike racks at the shop can be easily adjusted to hold different size wheels/bikes. Our design methodology was versatility, cost effectiveness, and cleanliness of design. 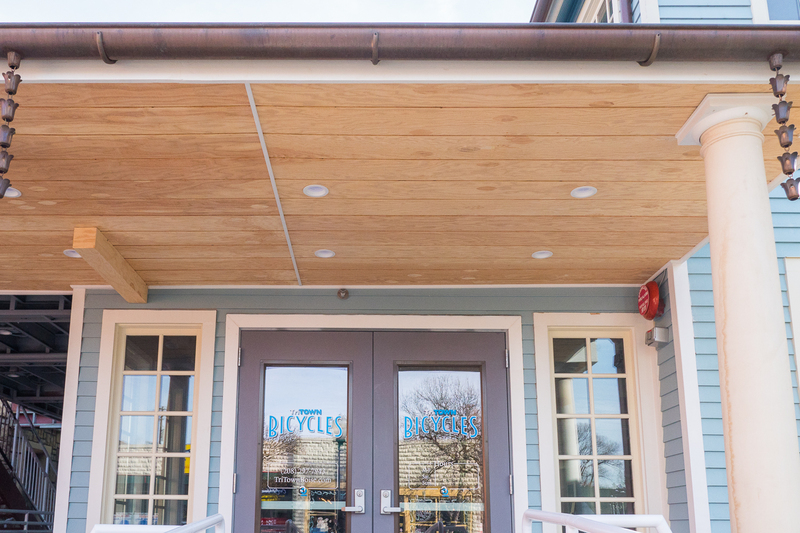 A French-cleat design allows the rack to slide side to side to accommodate different size bikes. The entire rack is made of plywood and cost less than $100. All lights were replaced throughout the building with LEDS. 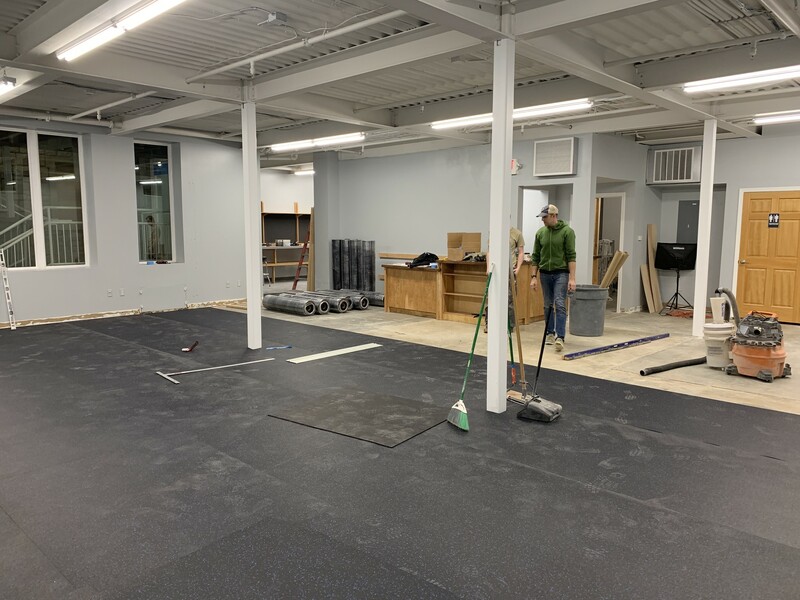 We thought the rubber floors would be easy to install, but like most things, it became obvious that quality work requires experience, thoughtfulness, and skill. 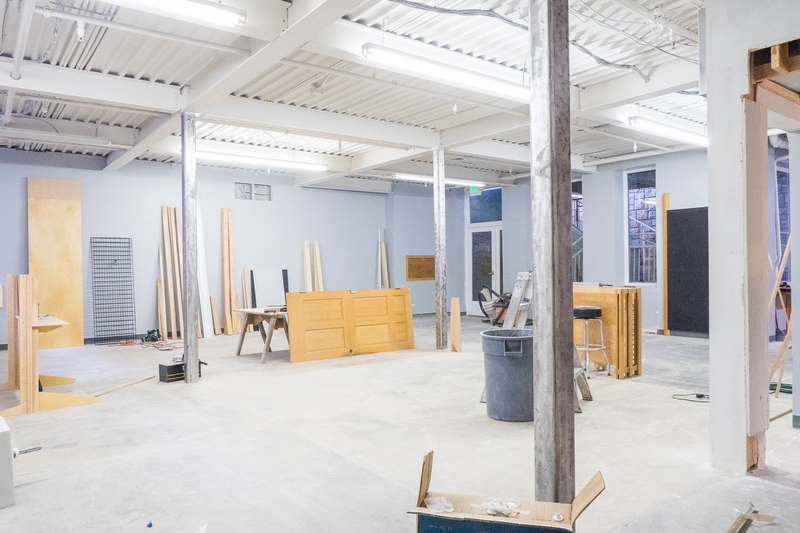 Almost all the shops furniture is built of birch and baltic birch plywood. 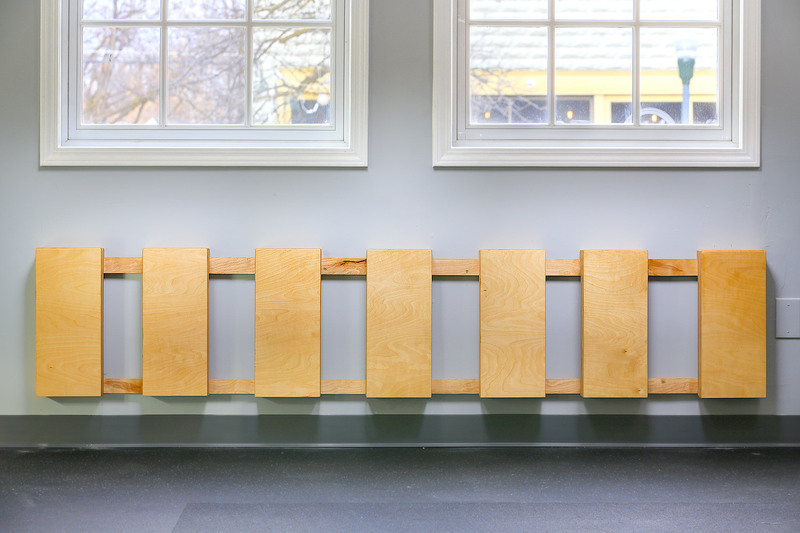 We love plywood's durability and versatility. And with a little attention to detail it can made to look beautiful too. 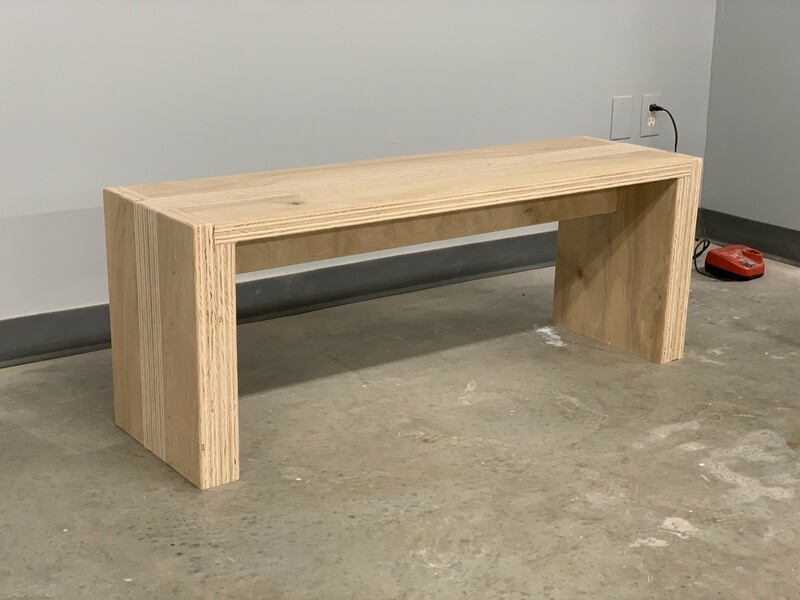 Here a shop bench awaits final sanding and lacquer. 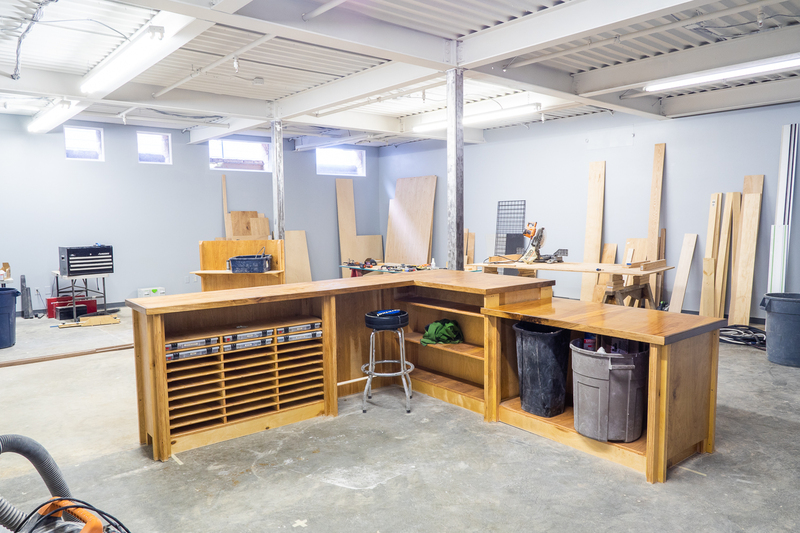 One of the benefits of building your own counters is you can build to fit your available space. Here the sale's floor counter is almost complete. Made of plywood with a walnut edge. 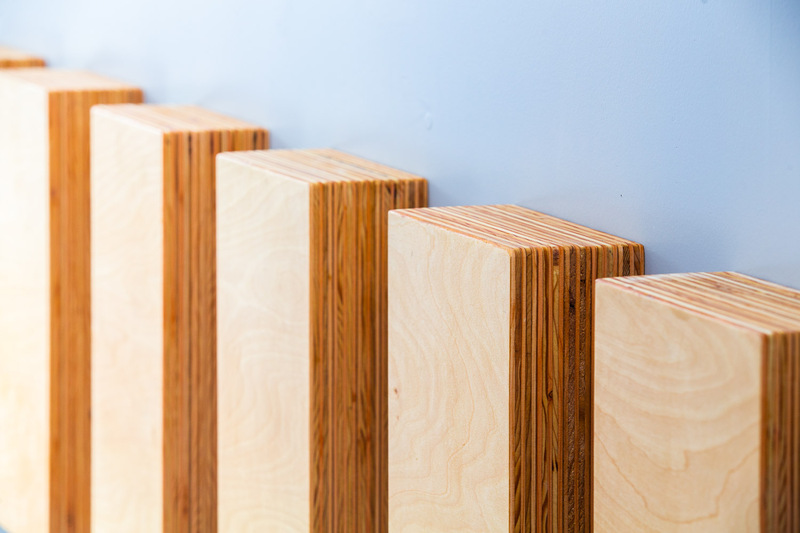 The end-grain of plywood can be beautiful if cut and sanded carefully. 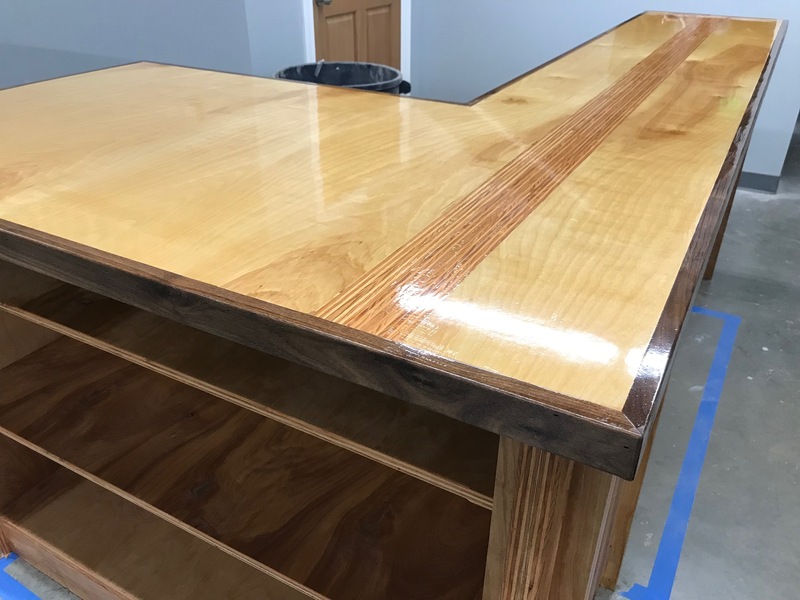 Here we used a plywood end-grain inlay to add a degree of visual continuation down the length of the countertop. The basement early on in the construction process. We have put much work into making the basement not feel like a 'dungeon'. The main floor soon soon after we finished painting the walls. The 'silver mine' gray contrasts well with the white trim and raw wood tones. 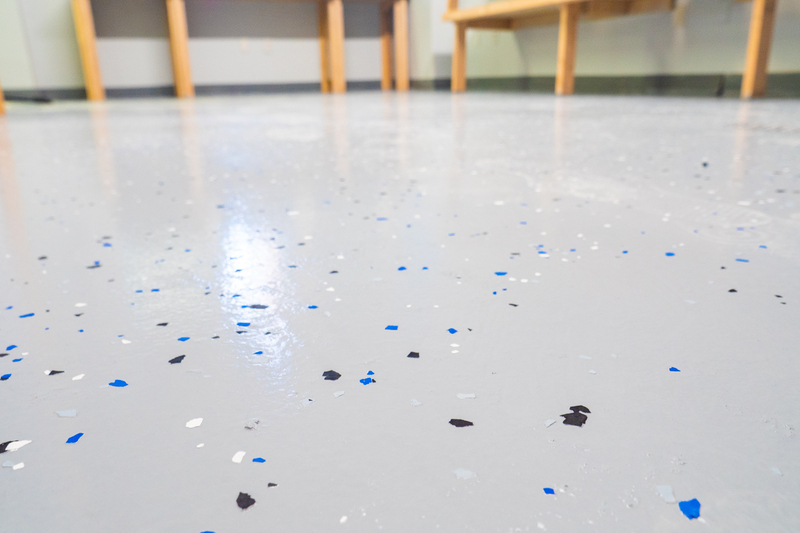 We used an epoxy on the service bay floors for it's durability and ease of cleanup. Service bay epoxy floor close-up. 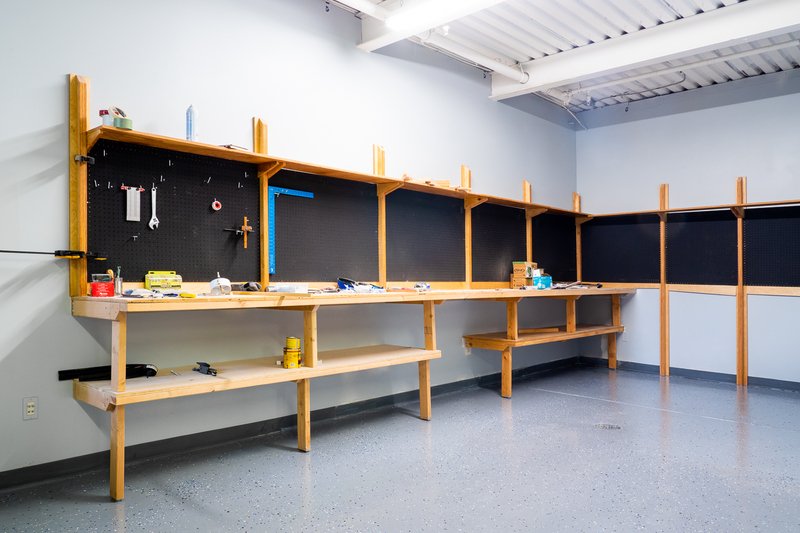 The service bay counter was one of the first pieces of furniture we built. 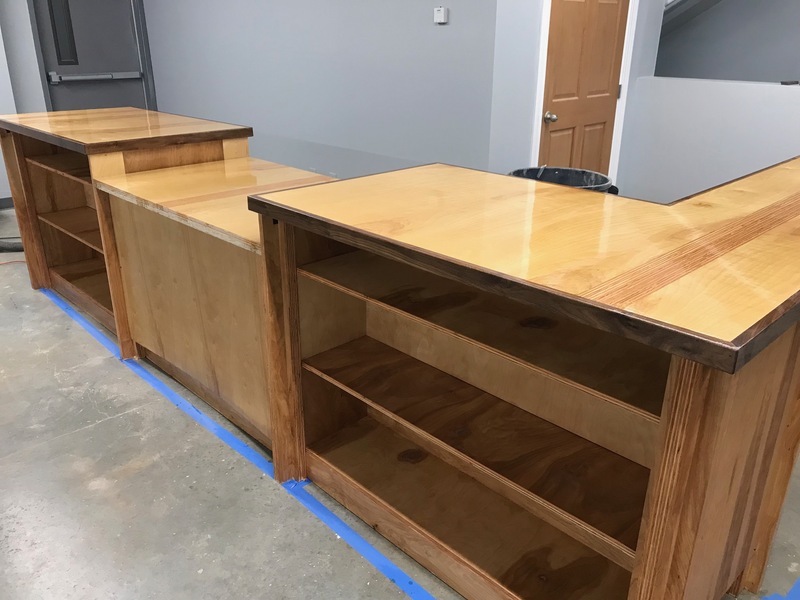 Built of plywood with a walnut edge, this counter will allow 2 mechanics to work on the floor and interact with clients. 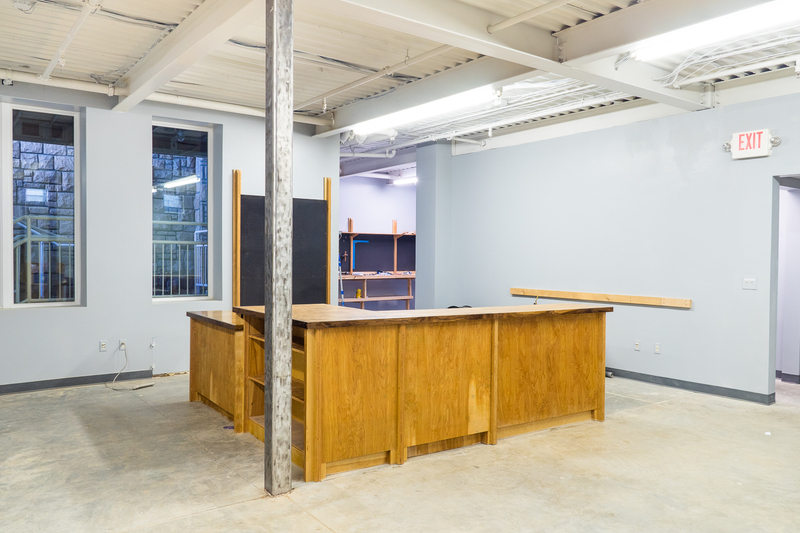 4 more mechanics will be able to work in the more private service bay located behind this counter. 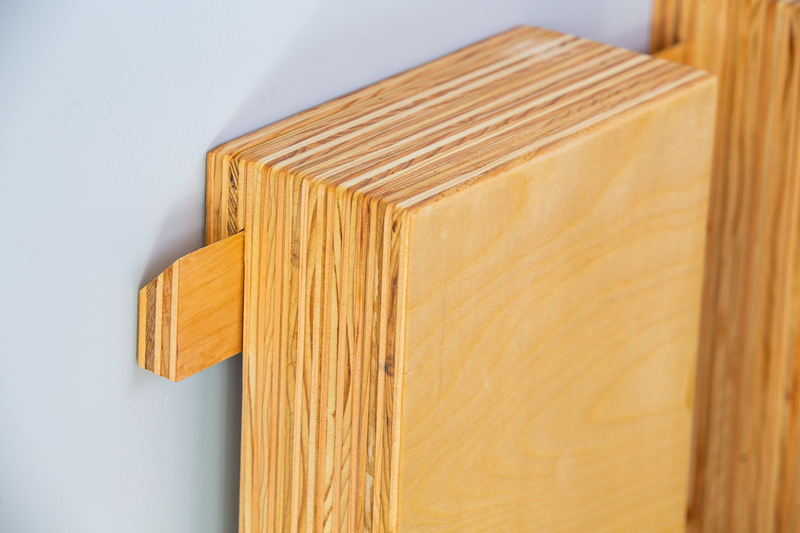 Building your own furniture means you can build features to fit your existing needs. 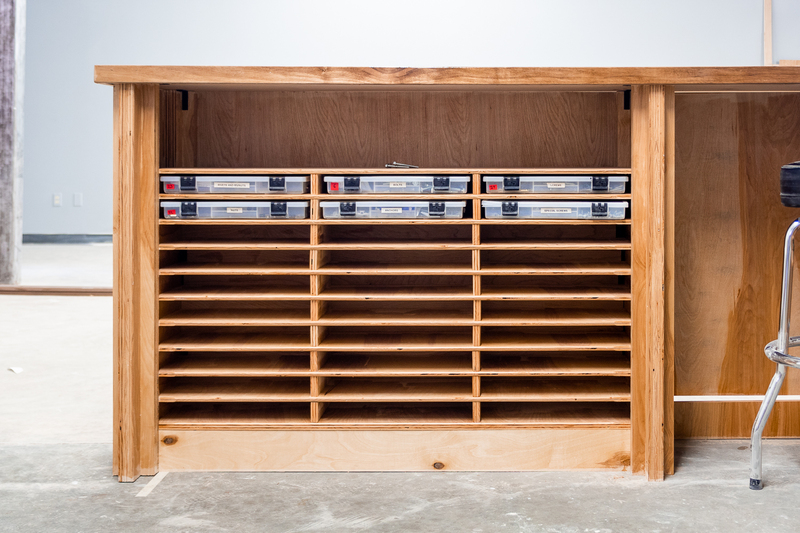 We love these plastic bins from Home Depot for organizing small parts. The service bay was originally designed to be a kitchen. 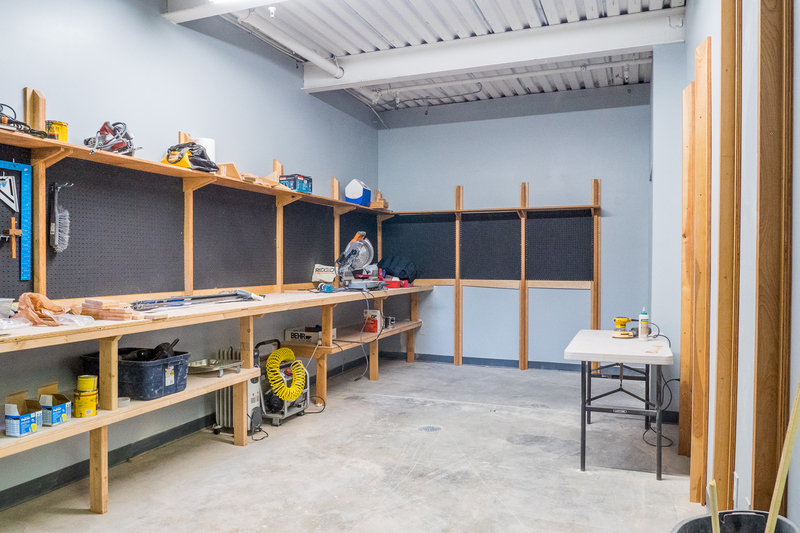 Those plans fell through back in 2008, but the service bay was the perfect place to store our tools and rip lumber. 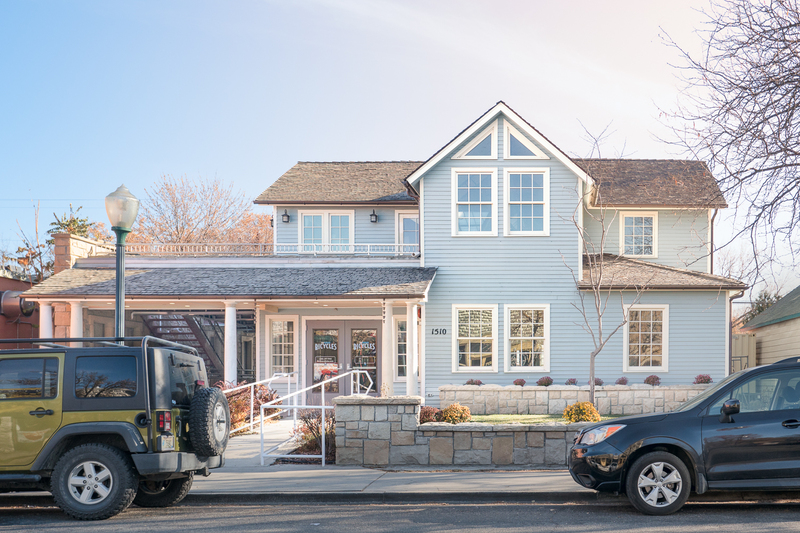 After the initial remodel of the property in the 2005-2008, the entire building was rebuilt to be supported by steel and concrete. No wooden walls in the building are structural. 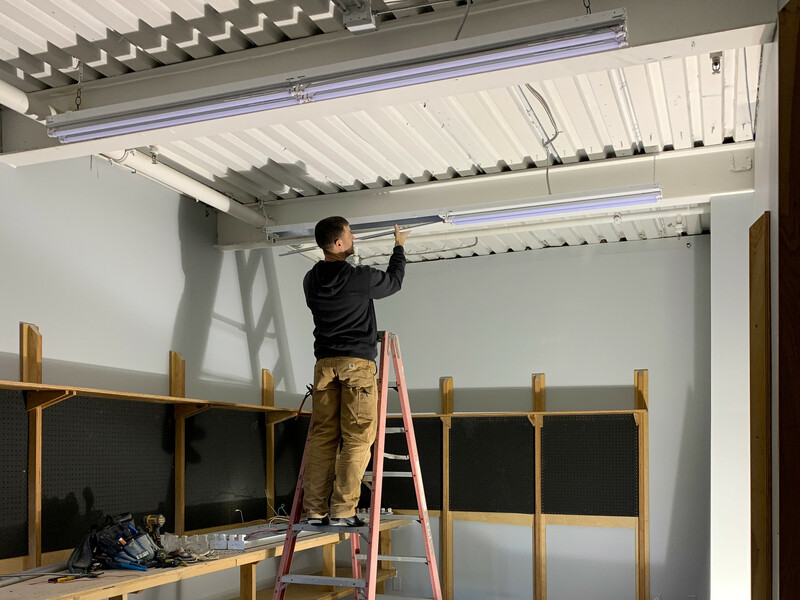 When we started working on the property in August of 2018 the first thing we did is begin building a service bay counter. The basement was in rough shape when we started the project. Almost every winter the basement flooded, and one winter a person squatting in the building set fire to an elevator shaft behind these walls. 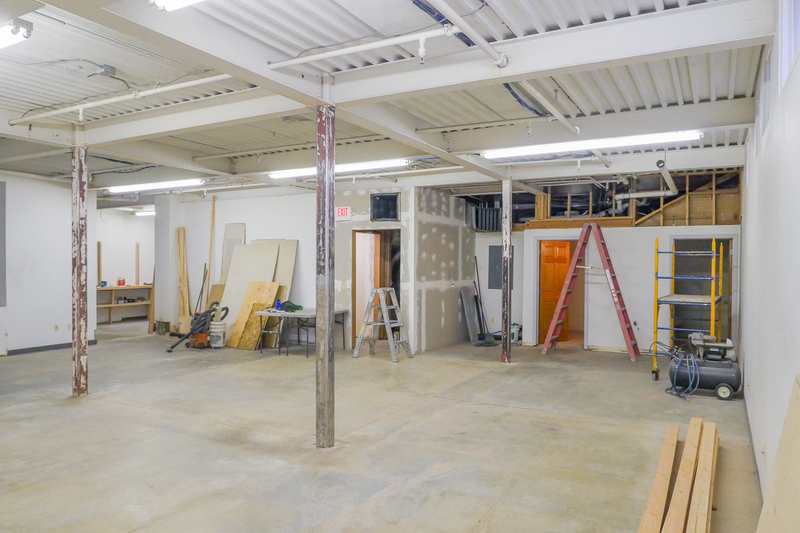 We removed some walls in the basement, and replaced much of the drywall. 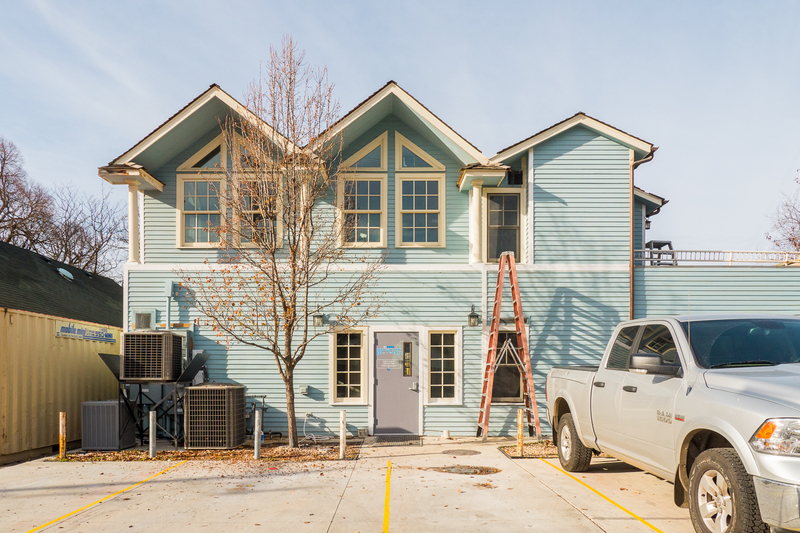 The breezeway and some of the siding was never finished, and one of our first projects was to complete the breezeway's electrical and insulation, and finish it with cedar tongue and groove boards. 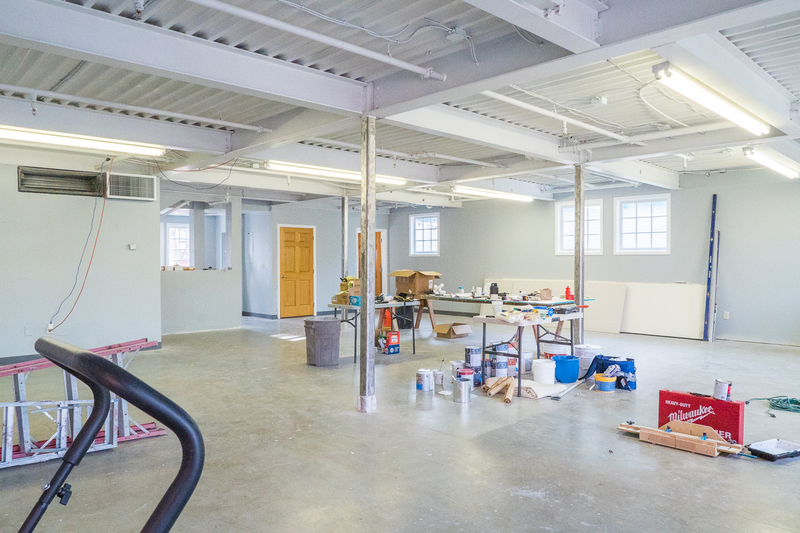 One of the first jobs we tackled on the building was cleaning up the ceiling and painting the walls. 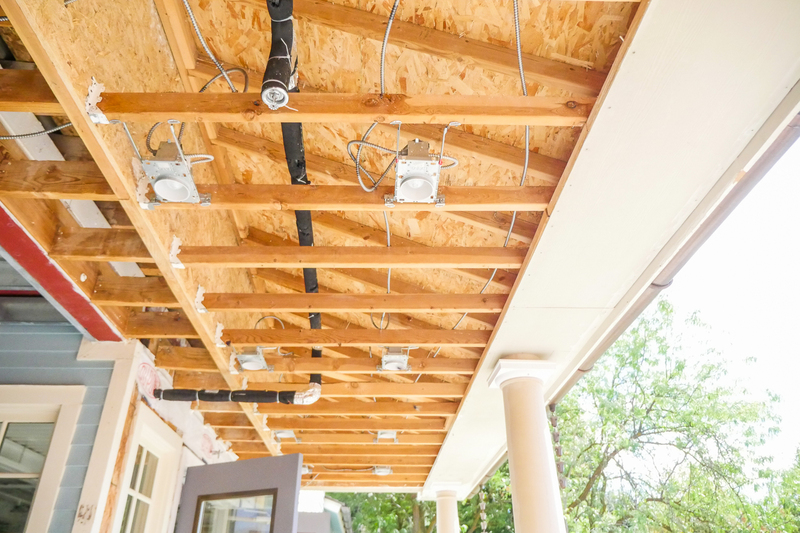 The original plan was for the property to have a drop ceiling to hide the electrical, but we like the tall ceilings and wanted to keep it as open as possible. Painting the ceiling an even white was more work than we could have imagined, but when finished was worth it.